So the fact that Astaxanthin is a natural sun block makes it ideal for me a a primer with my makeup and it does work. 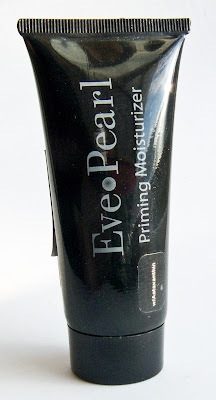 As a primer is hydrates and smooth out the skin for makeup. 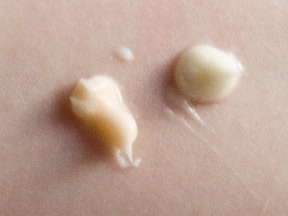 I've only had issue with silicone based foundation not wear as well with this under it. For those i use a silicon primer (like to like) but it use it with liquid, cream and mineral foundation beautifully. You could also use this as a daily moisturiser and for sun screen (but you should reapply it for sun screen). This is not what I consider a silicone primer, although dimethicone is an an ingredient it's list rather low on the ingredient list. Colour: I've notice these is a colour change to the primer but both the new and old format blends into the skin clear. Daylight swatches: Old and new primer. Although for days I know I'm going to me sweating a lot I use my Annabelle CC cream as a primer, but this is one I recommend for daily use for both it's priming and skin benefits and for those with sensitive skin to try out.